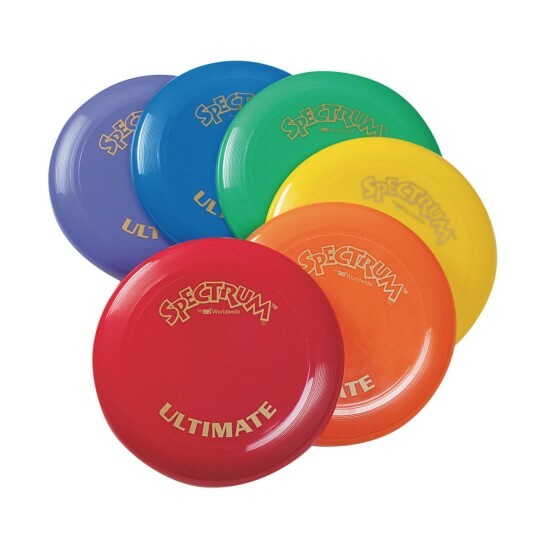 Spectrum™ Ultimate Flying Disc 11"
Optimal Size, Optimal Weight – It's the Ultimate! 11" diameter, 175 gram flying disc. Get consistent, long distance flight. Ribbed outer rim with improved grip. Perfect for competitive Ultimate disc leagues! The optimal size, the optimal weight – It's the Ultimate! Our 11" diameter, 175 gram flying disc is designed consistent, long distance flight. Ribbed outer rim provides an improved grip, making it perfect for competitive Ultimate disc leagues! Larger, heavier disc is recommended for ages 12 to adult. Set of 6, one in each Spectrum™ color. Easy for campers of all ages to use- great quality for the price! Good for H.S. PE Class! We use these discs in H.S. PE Class. They work great outdoors because they are heavy enough to not get caught in the wind and they also help beginner students. Inside or on pavement they broke half the time.